An impassioned, uplifting, and virtuosic tour de force from a treasured storyteller! Lost and alone in a forbidden forest, Otto meets three mysterious sisters and suddenly finds himself entwined in a puzzling quest involving a prophecy, a promise, and a harmonica. Decades later, Friedrich in Germany, Mike in Pennsylvania, and Ivy in California each, in turn, become interwoven when the very same harmonica lands in their lives. All the children face daunting challenges: rescuing a father, protecting a brother, holding a family together. And ultimately, pulled by the invisible thread of destiny, their suspenseful solo stories converge in an orchestral crescendo. 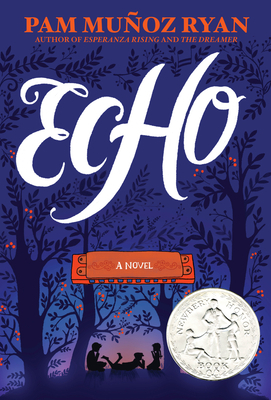 Richly imagined and masterfully crafted, Echo pushes the boundaries of genre, form, and storytelling innovation to create a wholly original novel that will resound in your heart long after the last note has been struck. Pam Muñoz Ryan is the recipient of the Newbery Honor Medal and the Kirkus Prize for her New York Times bestselling novel, Echo, as well as the NEA’s Human and Civil Rights Award and the Virginia Hamilton Literary Award for multicultural literature for her body of work. She has written more than thirty books for young readers. Her celebrated novels, Echo, Esperanza Rising, The Dreamer, Riding Freedom, Becoming Naomi Léon, and Paint the Wind, have received countless accolades, among them two Pura Belpré Awards, a NAPPA Gold Award, a Jane Addams Children’s Book Award, and two Americas Awards. Her acclaimed picture books include Amelia and Eleanor Go for a Ride and When Marian Sang, both illustrated by Brian Selznick, and Tony Baloney, illustrated by Edwin Fotheringham, as well as a beginning reader series featuring Tony Baloney. Ryan lives near San Diego, CA with her family.